St. Petersburg, Florida - AquaCal AutoPilot, Inc., the world’s largest manufacturer of swimming pool/spa heat pumps since 1981, is pleased to introduce its latest addition to the product line – The Great Big Bopper. 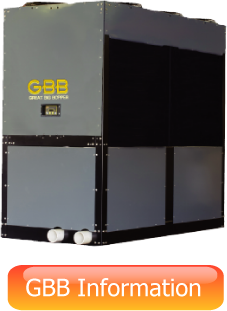 The Great Big Bopper (GBB) is the perfect solution for most large commercial pool applications, for both heating and cooling. A single unit features up to a half million BTUs with a 6.3 C.O.P. Its compact footprint alleviates the large space requirement for multiple unit applications. GBB’s dual plumbing feature and single electrical hookup allow for easy, convenient installation. The heavy duty design and construction of the Great Big Bopper ensure its durability and reliability, along with the quality expected of AquaCal heat pumps. This unit features the SuperQuiet operation unique to AquaCal. AquaCal AutoPilot, Inc. owner and President, Bill Kent, believes that "there is a huge opportunity for commercial pool builders and service companies to save millions of dollars in operating cost for their pool owner customers by converting old, inefficient gas fired pool heaters to this new, state of the art heat pump. Outdoor pools & spas are the target market for this highly efficient product. The Great Big Bopper has a design lifecycle that is double or triple that of a typical gas fired pool heater!" AquaCal AutoPilot, Inc. is part of the Team Horner family, employing about 300 teammates. Global Headquarters are located in Fort Lauderdale, Florida. Team Horner includes HornerXpress Worldwide, a Global Export business (to over 90 countries), 2 manufacturing companies, AquaCal AutoPilot, Inc.; and Lo-Chlor Specialty Chemicals and Algaecides. HornerXpress wholesale distribution, the team’s largest segment, has13 branches, covering all major population centers in Florida. Please visit our AquaCal Great Big Bopper webpage or contact your Export Manager for more information.